The Set-up: (as pictured). Divide the team in half (6 red players and 6 blue players). The white lines (field markings) will serve as out of bounds & coach should create a “shooting zone”. 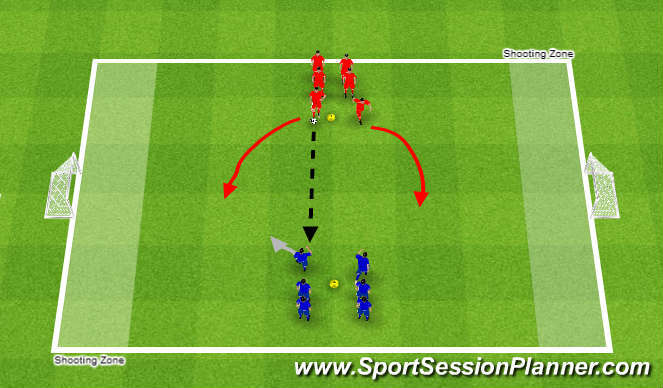 The Game: The Coach passes a ball across to an opponent and the first two white players moves out to defend. A “live 2v2 ensues to either goal! Players cannot shoot until they enter the shooting zone. Once a goal is scored or a ball goes out bounds, the next player in line passes the ball across and he and teammate move out to defend.